It's been a while since we've summarized some of the amazing ways miniature golf is having a positive impact on our communities and in that time there has been an abundance of articles about events big and small around the world. We're highlight some of the ones we find most fascinating in this latest installment of our series. You can visit Part 6 of this series to take a look at the last series of events. First up comes a major fundraiser out of Maine, USA. A lot of local charity minigolf events raise a couple thousand dollars for their cause. This event, Putt 4 Cass, raised over $18,500 (~15.870 EUR) for the Big Brothers Big Sisters program, in honor of a local volunteer who died in a tragic accident in 2014. This was the second year of the minigolf event, which had replaced a previous bowling event for the same cause. It was played at Gifford�s Famous Ice Cream & Mini Golf in Waterville. Both the format and the reason for coming out are obvious draws as over 200 people played on over 50 teams for the event. This next event doesn't give an amount raised when it was held back in 2017, but the focus of the event was a group critical to our sport - children. In Illinois, USA, the Crisis Nursery, an organization that aims to prevent childhood trauma, abuse and neglect, as well as protect the children who live under such circumstances, held their first minigolf charity event. While not only raising funds to look our for children, the event was also more youth focused than many charity events with age brackets for awards starting as young as 4 years old. Hopefully an event like that connects with these young putters and they see miniature golf as a positive influence on the rest of their lives. 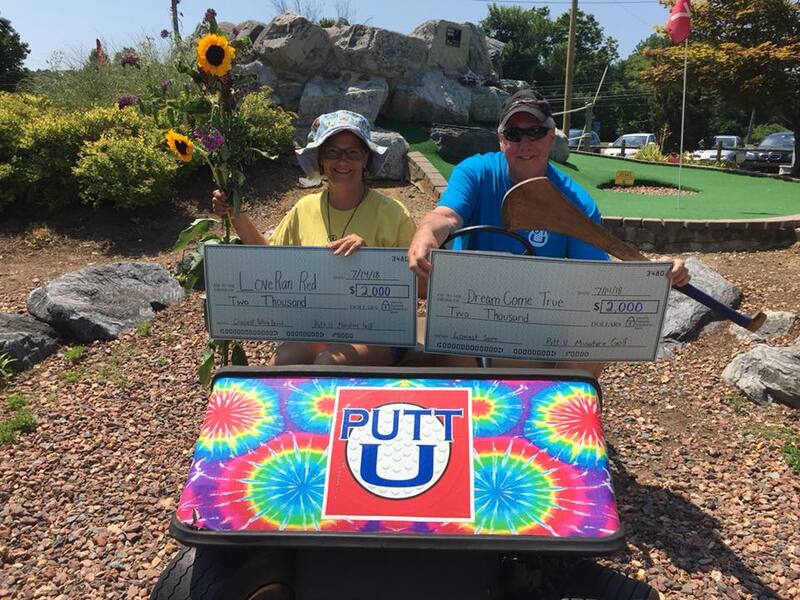 At Putt U, the course that held the 2016 U.S. Open, they took a different approach to charitable miniature golf in July. To celebrate their 20th anniversary they held an "anything but a putter" charity tournament. Participants could choose any instrument other than a normal golf putter to play the tournament with and the choices ranged from cricket bat to plumbing and everything in between. Winners got to select a local charity to sponsor and over $4,000 (~3,430 EUR) was awarded to charities as a result of the tournament. You can see the final results and some great pictures on the course's Facebook page. Finally for this part, in Massachusetts, USA, charitable miniature golf was combined with an educational gain. A 7th grade class assignment called Power of One was placed to the students, challenging them to do an activity that showed how one person can help change the world. James Ellard took this challenge and decided to run a miniature golf tournament to support Alzheimer�s research. His hard work earned his chosen charity almost $2,000 (~1,720 EUR) and he earned an even more valuable lesson in the impact of one person, all though the sport of minigolf. Looking ahead a bit, there is an event in August in upstate New York, USA. The Miniature Golf Smackdown event is in it's 3rd year and supports the local Tioga Arts Council. In Farmington, CT, Farmington Miniature Golf is having their 37th annual tournament in late August. While it's a competitive tournament (you'll hear more from our editor as he plays it for the 6th time this year), it's main goal is to raise money for the Jimmy Fund and UCONN Childrens Cancer Fund. In 2017, almost $1,000 (~860 EUR) was raised from the tournament, pushing the total to over $15,000 (~12,870 EUR) for the event's lifetime.